What is my password for my lease agreement? Why is the chat function not working? What do all the different locations mean? Is paying with a credit card online safe? Do I have to pay any taxes on my vacation? Do you have an event fee? I don't see rates for next year. When will they be available? Where / what is Club Seaside? Does Seaside Vacations provide baby equipment? Does my property have internet access? What are your policies on bringing a pet? Can we have the pool heated? I have keyless entry. Do I still have to come to the office? Your password is your lease number. For the chat function to work properly, you must have Java installed on your computer. Not all computers will have this installed by default. You can download the Java install file here. There are two (2) roads running north/south on the Outer Banks. The "Beach Road" (NC 12) is a 2-lane road with a speed limit of 35 MPH. The "Bypass" (US 158) is a 5-lane road with speed limits 45-50 MPH. Please note: The Bypass is incredibly busy during the summer season on the Outer Banks. Seaside Vacations advises our guests to please take safety precautions when traveling on the Bypass. If you must cross the Bypass on foot, please make sure to do so at designated pedestrian crosswalks - never using the center turn lane as a stopping point. Oceanfront - An oceanfront home has no homes or buildable lots located between it and the ocean. The distance between the home and the ocean may vary. Semi-Oceanfront - Semi-oceanfront homes are located one lot back from the ocean and may or may not require crossing the road. Children always will need assistance to cross any road, and may or may not have a home between it and the beach. The distance to the water, beach accesses, and views vary. Oceanside - These homes are located east Highway 158. These homes have two or more homes between them and the ocean. These homes may or may not require crossing a road, and may or may not have an ocean view. The distance to the ocean varies. Soundside - These homes are located west of Highway 158 from Southern Shores to Nags Head and west of Highway 12 from Southern Shores to Corolla. The distance to the sound and views vary. Some homes may not have direct access to the sound (soundside homes in the village of Duck do not have direct access to the sound). Soundfront - These properties front the sound with no homes or lots in between. The distance to the sound, access to the sound and the view vary. Sunsets can be gorgeous! Our credit card transactions are processed by a third party provider.AscentProcessing Inc. provides a safe, secure way to manage credit card transactions. We offer travel insurance through Red Sky Travel Insurance. We highly recommend a travel insurance plan, especially since the Outer Banks is so prone to hurricanes. The travel insurance plan is priced affordably and cover a variety of issues that could impact your vacation should unforeseen circumstances occur. As they say on TV, “Life comes at you fast.” Most notably would be a mandatory evacuation due to a hurricane. Here are a few other things covered by travel insurance: sickness, injury or death of you or a family member, business partner, or traveling companion, the insured’s principal residence being made uninhabitable by fire, flood, vandalism, or burglary, involuntary termination of employment, military duty, etc. If you would like to have specific questions answered, please callRedSky Travel Insurance at1-866-889-7409. Remember, in order to have coverage due to a named hurricane, a travel insurance plan cannot be added after a tropical storm becomes a “named hurricane.” We tell you this because it could be very costly to wait. You would have to contact Red Sky Travel Insurance for specific details. Unfortunately the tax man doesn’t take vacations. Obviously, we do not set the tax rates and we only collect the taxes for the county. If your rental home is in Currituck County (Corolla), the tax is 12.75%. If your home is in Duck, Southern Shores, Kitty Hawk, Kill Devil Hills, or Nags Head, the tax is 12.75%. Seaside Vacations homes allowing special events will list "Event Home" in the "Amenities" section. There will be a $2,000 non-refundable event fee and $1,500 refundable security deposit included on all reservations with a special event. We publish rates for the following year in March of the current yeat. You may reserve the home by paying the first half of the rent or by setting up payments with our Vacation Layaway Program. 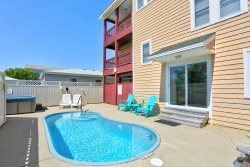 Club Seaside is an exclusive program consisting of complimentary events and discounts on popular Outer Banks activities that are exclusive to Seaside Vacations guests. * Just click on Club Seaside on the left side of our websiteto obtain more information including schedules, contact information and to make reservations for each activity. *Some events include a small material fee. Some homes provide baby equipment. The age and quality of play pens, high chairs, etc. varies from house to house. You can see if a home provides baby equipment by checking the amenities section on the individual property pages of our website. Baby equipment usually includes a port-a-crib, high chair and a baby gate. Linens and towels are provided for ALL of the homes in our vacation rental home program. Beds are made prior to arrival (with exception of top bunks). There are enough towel sets for the number the house sleeps. One bath towel, one hand towel and one wash cloth per person are provided. The towels are placed on each bed in the home. One bath mat per bathroom is provided. (Towels are not freshened daily.) Two potholders, one dish towel and one dish cloth are provided and are placed on the kitchen counter prior to your arrival. We do offer extra sets of both towels and linens at an additional charge. For prices and to place an order, contact a Vacation Specialist at 866.884.0267. Please Note: Bunk beds, pyramid bunks, sleep sofas and trundle beds are not made prior to your arrival. Linens are provided for them and are placed on the respective bed. Unfortunately, we do not provide sheets for cribs. Many of our properties do offer internet access. Please check your property's website description to determine what type of internet service (if any) is available. If your home doesn’t provide this service, there are many free WiFi hotspots all over the Outer Banks. Pool heat is available with some of our homes typically between April-June and September-October. There is an additional charge for pool heat and this charge varies by home. Please remember that most pool heaters will only heat the water 5 to 8 degrees above the outside air temperatures. For example, if the air temperature is only 60 degrees, the pool water will likely be no warmer than 68 degrees. Pool heat does not give a “hot tub” effect, it merely prolongs the pool swimming season. Please know that we want to get all of our guests into their vacation home as soon as we can. Our check in time begins at 4:00 p.m., as the houses become available and are released by Housekeeping and Maintenance. We will be happy to check you in as soon as the cleaners/inspectors give us the "OK." Again, please know that our goal is to get you on your way, enjoying your vacation, as soon as we can. *Guests staying in keyless entry homes may proceed directly to their vacation rental home. If your home is keyless, you may proceed directly to your home at 4:00 p.m.
Our keyless entry service allows you to go straight to the home on check-in day, any time after 4:00PM! In addition, when checking out, you may head straight home (skipping our office). If called and requested, at least one week in advance, we do offer early check-in for homes with 1-5 bedrooms. The cost for early check-in is $125, plus tax. Early check-in is at 1:00pm. Unfortunately we cannot offer this service on homes with 6 or more bedrooms. Check-out is at 10:00 am on day of departure. Cleaning crews arrive at the home at 10:00 am; your prompt departure is appreciated. All keys are to be returned to our office upon departure. (Keyless entry guests do not have to stop by the office to check out). Clean out the refrigerator and leave the refrigerator/freezer settings on medium. Please leave any unopened, nonperishable food items on the counter in the bag provided for the local food banks. Please turn off all inside and outside lights. Remove toys/trash from the pool area. Make sure the hot tub cover is secure. Strip the linens from the beds and pile them at the foot of th ebed. Leave the towels in the bathroom. Make sure the propane tank has been shut off for all gas grills. Please clean any and all grills using the grill brush provided. Please make sure you close and lock all windows and doors and also have someone check the security of all doors and windows from outside the home. If you have any further questions about your Outer Banks vacation please email us, or call us at 866.884.0267.